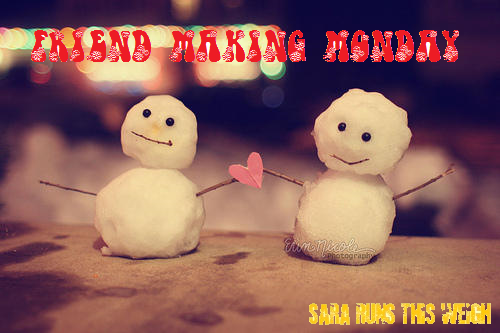 Sara Runs This Weigh: Friend Making Monday: How was your Christmas? 1. How was your Christmas? It sucked. I had to work…that was not the reason it sucked. It sucked because usually at work, those of us that are working put together a potluck spread. That did not happen this year. Also, even though I had to work and I’m sure most people I know that live near me knew that, it still would have been nice if someone had reached out to me and said something like “if you didn’t have to work, you could come celebrate with my family” or “want to come over before work?” But, nope. On my way home from work, I stopped at Walgreen’s because the grocery store was closed and bought a frozen pizza. The cashier asked “is this your Christmas dinner?” Gee, thanks for making that sound all depressing and pathetic, yes as a matter of fact it is my Christmas dinner. 2. Did you get any gifts you weren’t exactly happy with or just downright hated? Nope. The people that buy me gifts know what I like, thank goodness! 3. Did you get any gifts that you loved? What was your favorite? YES! I loved so many of the gifts I received this year. My favorites were a beautiful necklace my friend Patricia bought me that has a silhouetted lady petting a silhouetted cat on top of a heart. From my friend Amanda, I really loved the funky cat cookie jar and the coffee fairy statuette. 4. Did you have a gathering (friends, family, co-workers) to celebrate and eat? 5. What is your favorite food and/or drink of the season? PIE. Any and all kinds of pie (except mincemeat). 6. Do you have any sporting events you like to watch on or around Christmas? Just whatever is on. I do like to watch a football game if there is one on. 7. Do you go to any tree lightings or trail or lights? 8. Did you ever have your photo taken with Santa as a child? I’m not sure. I want to say yes, but then I haven’t seen any if they exist. I should ask my mom. 9. If you have kids, do you take them to get their photo taken with Santa? No kids…but one year I did take my dog to get his picture taken with Santa. Haha. I would take the cats, but they freaked out enough with the whole Glamour Shots thing and I promised I would never do that to them again. 10. Do you gather at a particular person’s house every year for Christmas, do you rotate who hosts Christmas, or do you just do your own thing? When I was a kid, we did our own thing. Thanksgiving was the big family get-together. On Christmas morning, we would wake up. As soon as the parents were up, we were allowed to start opening presents…until they got up, we just sat there and stared at the presents and wondered what we got. After all the presents were opened, we would go to a fancy hotel and have brunch (I think this was just when us kids were older…when we were younger, I’m pretty sure we just did a Christmas lunch/dinner at home). As for what happens now, I live by myself, no kids, no significant other and I work in a job that doesn’t shut down for the holidays, so I’m usually working. So, I don’t do anything special except maybe make something to bring to a potluck dinner at work.